From an extended family that has produced some of America’s best, Crouser started throwing at age 10 and by the time he graduated from high school had thrown the prep implements 77-2¼ (23.52; still the indoor HSR) and 237-6 (72.39; another HSR). He won four NCAA shot titles for Texas. As a professional, he has put the discus on the back burner (see sidebar) and focused on the shot, a move that paid huge dividends in his first year out in ’16, as he ascended to the top of the world stage, producing lifetime bests to win both the Olympic Trials and the Olympic Games. 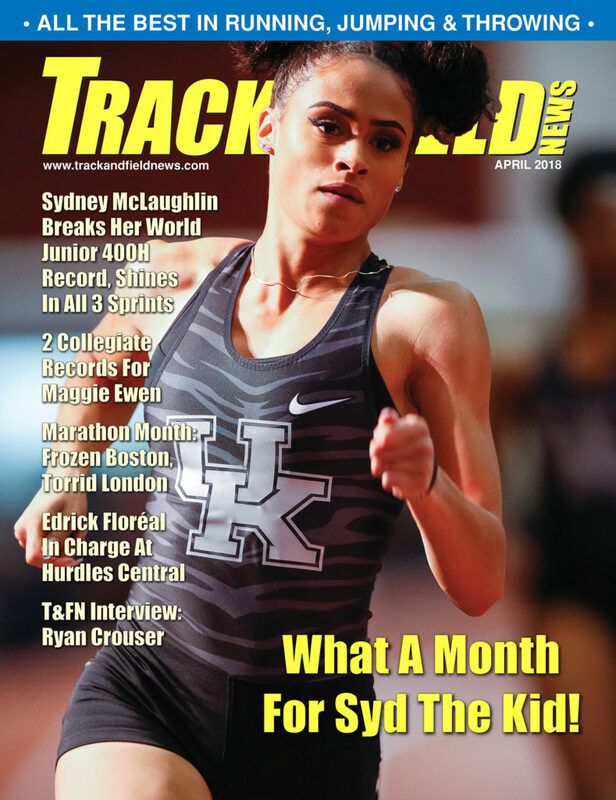 Last year was nearly a repeat of that fairytale season, as he won USATF with a PR 74-3¾ (22.65) and again ranked No. 1 globally despite not winning either of the two biggest meets of the year. Not making the podium at the World Championships stung, as he had produced a third-round monster of a throw that would have won but for the controversial red flag that flew up. Officials said his heel had grazed the top edge of the circle at the back of the ring. Appeals came to naught and Crouser, admittedly having an off day, failed to medal. A finger injury over the winter hampered his off-season practice, but the 25-year-old strongman, who trains at the Chula Vista Elite Athlete Training Center outside of San Diego, took a break from working on his bass boat (see sidebar) to talk about how excited he is to compete again. T&FN: How has the off-season been treating you? Crouser: Overall, it’s been good. I had the hand injury the last week of January and so that was frustrating because I felt like I was in really good shape going in. I was planning on doing the indoor season, but I had to sit out 2 months. I’ve just finished 4 weeks back throwing, so I’m happy with where things are at, especially with minimal throwing under my belt. T&FN: Who would you call your coach at this point? Crouser: Kind of a mixture. I’m pretty relatively self-reliant. I work with my Dad [Mitch] a little bit, check in with him about once a week, send him some videos and he goes over them. And I work with John Dagata, the resident coach. He oversees a lot of day-to-day stuff and does a good job at facilitating everything in terms of just keeping an eye out and making sure I have everything that I need. T&FN: Is there any other thrower that you kind of use as a technical model? Crouser: Not too much. I take little things here and there from everyone. In general the rotational technique is still relatively new. I mean, it didn’t really start catching on until the ’80s and I would say hasn’t really been perfected. You see recently the spin has really kind of taken over as we’ve become more technically proficient. As one of the tallest rotational shop putters, it’s also a little bit different because the technique is definitely quite different for me being 6-7 compared to say Joe Kovacs who’s about 6-0. T&FN: Tripp Piperi at Texas says he can’t model his throwing off you because you’re too tall. ’13—x,7; ’14—x,6; ’15—x,8; ’16—1,1; ’17 —1,1. Crouser: Yeah, height definitely makes a difference. In discus a little bit, but when you take away that ring and make it over a foot smaller [in the shot] that’s a pretty big difference for us tall guys. T&FN: Are there any specific things you’re trying to work on now with your style? Crouser: Nothing too big. Last year there was a lot of potential there. Definitely being very consistent over 22 [72-2¼], in that kind of 22.20–22.40 range [c72-10–73-6]. And then when I went to peak for World Championships, I kind of lost my feeling for the throw a little bit. The biggest thing I’ve really worked on since then is more just the feeling for the throw, going back to working a lot on rhythm and timing and having an athletic approach to throw as opposed to just being big and strong and trying to muscle it out there. So I’m about 10 pounds [4.5kg] lighter this year and quite a bit leaner. The biggest change for me technically is not focusing so much on just the movement in hitting certain positions, but kind of transitioning through the positions and making it more fluid. T&FN: How does your weight fluctuate throughout the season? Crouser: I’m about 300–305 (c135kg) , right in there. I’ll probably start off the competitive season about 305 and end up around 303 or 300 through most of the season. Towards the end if I get down to 295 (c135kg), I think I’ll still throw plenty far at that weight. In the past I’ve always been surprised—kind of towards the end of the European season—as my body weight starts to drop, I expect the throws to go down, but I kind of make up for that with the speed and the feeling of throws. Once you get, say, 10 or 20 meets under your belt towards the end of the year, that technique and the feeling for the throw get a lot better. T&FN: Do you have to stay on a diet to be where you want to be? Crouser: Yeah. For me it’s always been difficult to gain weight and so as soon as I stop training, I drop weight pretty fast. For this year, even though I’m 10 pounds lighter, I still have to gain close to 20 pounds at the start of the season, all through the fall. I stay close to 5000 calories a day to maintain body weight and about 5500 if I’m trying to gain muscle. So I eat usually 5–6 meals a day and try to space them out. I’m kind of constantly eating—for me—relatively small meals. They are about 1000 calories each, so it’s more than a normal person should eat. T&FN: At 5 or 6 meals a day is eating fun anymore? Or is it just a chore? Crouser: For me, training eating is more like training than it is enjoyable. Everybody says, “Oh, I wish I could eat 5000 calories a day.” But it’s definitely different when you have to eat 5000 calories a day every day, 7 days a week. It’s funny for me when I have my “cheat,” if I take a cheat meal, usually on a Sunday, I just skip a meal. T&FN: When you were talking about speeding up your throw and working on the athleticism of that process, do you work with different weights of shots? Crouser: I do. I’m a big fan of throwing lighter shots; for me it helps the feeling for the throw. And also, I mean if you can’t throw a light shot far, you’re not gonna throw the comp weight shot far. So that’s how I go about it. I throw a little bit of heavy shot but not very much. For me I just don’t respond to them as well as some of the other throwers. And so I focus on throwing lighter shots quite a bit more. T&FN: What range of balls do you work with? 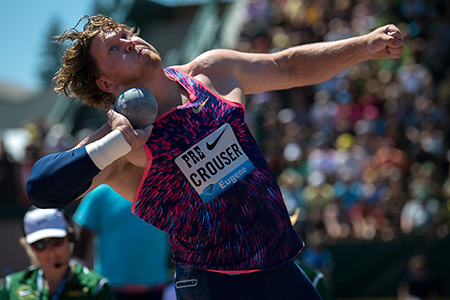 Crouser: I’ll throw an 18-pound [8.16kg] shot just on my stand throws, to work on that specific strength and then if I do full throws, I’ll use the 17-pound [7.71kg]—so just a pound over comp weight. For me the 17-pound or anything more than that really starts to slow me down. Even then I limit my throws with the 17-pound. I throw quite a variety. I’ll throw the 15.5 [7.03kg], the 15 [6.8kg], the 14.5 [6.58kg] and down to 14 [6.35kg]. I have gone as light as a 3K [6.61lb] before, but usually don’t go below 14 unless I’m really trying to work on something. T&FN: I’m curious. For so many years in our sport we’ve idolized Mike Carter’s big high school record in the shot [81-3½/24.77]. Have you ever as a pro thrown a 12-pound [5.44kg] shot to just see if you can go past that? Crouser: I’m sure I could if I gave it a couple of days of training. If I’m in shape to move at that speed, I think I could probably throw pretty close to that. But even when I was in high school and throwing well—I had throws at Carter’s record before I got hurt my senior year in training. I’ve also thrown a 14-pound over Carter’s high school record. That wasn’t an easy throw—that’s throwing all out. So it’s impressive that a high schooler could throw that far and now at the elite level as the Olympic gold medalist, it’s still not an easy distance to throw with a shot that is only 2 pounds heavier. That record is way out there. T&FN: With your family back in Oregon and you having spent so much time in Texas and now living in California, how do you self-identify as these days? Are you a Texan? Crouser: I don’t even know at this point. I was born and raised in Oregon, so I guess probably an Oregonian. I still have an affiliation and love for Texas. I feel like California for me is right now I’m just passing through in training. Ryan Crouser has talked of his enjoyment of hunting and fishing. Does he think that recreational activity has helped his throwing? “I’d say especially during the off-season. I have a little bass boat. I take that out just as a means to get away. I think you’ll find that any elite athlete at this level when you’re training full time has had a means to an escape. Just to clear your head and get away from it because the sport can become so encompassing that that’s really all you can focus on. “For me fishing and hunting have been really beneficial in terms of just giving myself a little break. I might just take the boat out for a few hours on a Wednesday after practice on my recovery day and just clear my head. Just do something to get my mind off it, something relaxing to do. It’s a good thing to practice being able to clear your head. T&FN: When you’re competing, what do you think about out there? 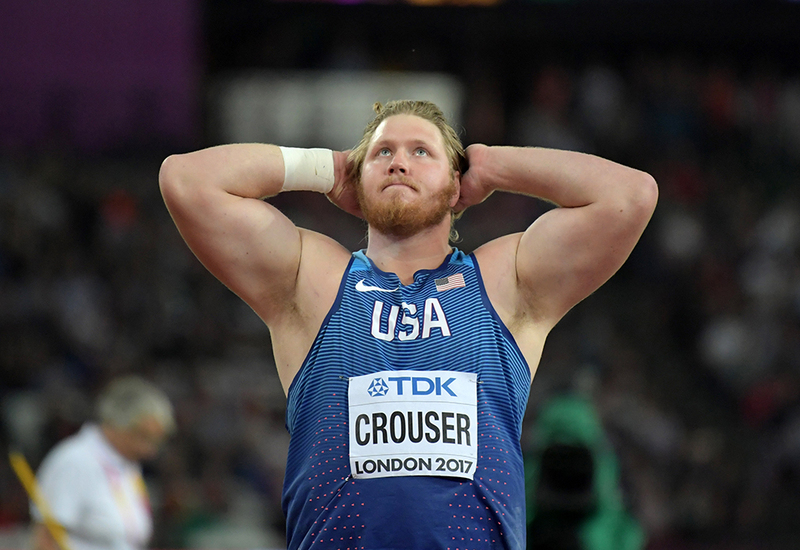 Crouser: On my best throws, my mind is pretty much blank. There’s not really any thinking at all. You’re almost in a Zen state. It’s called different things: being in the flow or the zone. For me it’s almost like if I meditate. Your mind is completely blank and your body is relaxed and you just react. It’s never a good thing if I’m having other thoughts running through my head at all, especially, if they’re not throwing-related. But when I am throwing really well, my mind is completely blank. T&FN: What is your favorite ring to throw at? Crouser: I’d say it would be Hayward Field. I mean it has good memories and the crowd and the atmosphere that goes along with it is always good and that field has more 70-foot throws than anywhere else in the world. But I’m not too picky. I mean, if it’s a nice, decent ring with a flat place to land, it’s pretty good. As long as I’m not throwing out or anything like that, I’m pretty easy to please. As a long and lean 16-year-old prodigy, Crouser made the October ’09 cover of T&FN. T&FN: Jumping way back to 2010–11, you had some injury problems. Do you think that changed your longterm progression as a thrower? 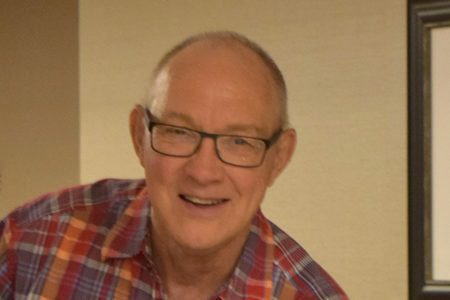 Crouser: 2010 was a rough year and it was in May I broke my fifth metatarsal in my left foot with a Jones fracture and that had to be surgically reconstructed and put me in a cast in a walking boot until about October. That really slowed things down. But the most frustrating was my senior year [in high school, 2011]. I was in unbelievable shape and threw 77 indoors and got the indoor record and was really throwing well going into the outdoor season. And then I just had a series of small injuries messing up my back, rotating my L4 and L5 vertebrae a little bit. Then I tore my adductor right after I got over that. It was just a series of really unfortunate smaller injuries and that slowed me down because I realistically thought I could have thrown in the 240s, maybe 250 [73-76m] in disc and got Carter’s outdoor record. I really started to learn to deal with injury and battle back from those. It did slow me down but I think since then the progression has caught back up. If I had stayed healthy then I don’t think I would be any farther than I am now. None of them luckily were lingering injuries that stuck with me. T&FN: Is there anything on your bucket list that you don’t do as an athlete for fear of injury? Crouser: Some of the big trips and stuff that I would like to do, I have to sit out. My cousin Sam, he was in Rio with me in 2016 and he’s looking at going to Christmas Island in the Indian Ocean to go on a big fishing trip. I was looking at that, but I can’t really take two weeks off of training in the early spring and do that. Trips like that take a backseat until I’m done training. T&FN: Let’s talk about last year a little bit. You ended up No. 1 in our rankings, but with no podium and not winning the DL Final, it wasn’t really a fairytale year like 2016. Did you end up feeling disappointed? Crouser: It was a year of mixed emotions. In terms of average distance, I think it was one of the most dominant years ever. If you took out the two major meets, I definitely think it was close to a perfect year and that it really laid a lot of foundation going forward into this year. My training is definitely working and the consistency is there and it really showed me where I need to get better, which is my peaking. I consistently go off about 70cm to a meter from my training load to when I peak. I just didn’t get that at World Champs when my technique really went down the drain. On the bright side it shows me that there was still a ton more there, but unfortunately, I had to lose my rhythm and feeling for the throw at World Champs. And Diamond League was really kind of a different story. I started getting my feeling back after Worlds. I went down to Portugal and trained at a semi-training camp. Almost just a little bit of a vacation. I was still throwing every other day, hanging on the beach, having a good time waiting for the season to end and I kind of checked out and got away from it. That was after I had spent, I think it was almost eight weeks in Europe, and every day focused on throwing. 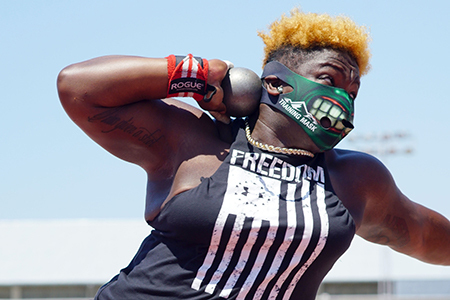 I just went and hung out on the beach, threw a little bit, trained a little bit and my throwing was really starting to come back together and then I had a meet and threw 22.35 [73-4] in Portugal and felt really good going to the Diamond League Final. I threw 22.37 [73-4¾] there on my opening throw. Seeing how everyone else was throwing, I just thought for sure that was going to win. And I had some pretty big throws in practice going into that meet. 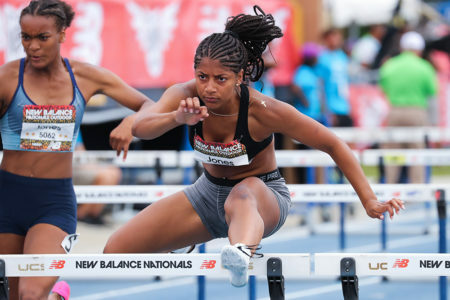 So I felt comfortable just going all-out and saying, “OK, I’m just going to go for a big PR, try and get over 22.70 [74-5¾].” And out of nowhere Darrell [Hill] came with that 22.44 [73-7½] throw. That was just as much a surprise to him. And a surprise to everybody there. He just had an unbelievable throw. So he deserved to win that one. Looking back on the season, it was a couple of frustrating moments, but I learned a lot from it and came into this year very, very motivated and so I’m just excited to be back throwing and healthy now and I’m looking forward to learning from those experiences. I’ve definitely used them to motivate me going into this year. T&FN: With London and all the controversial foul calls, looking back on it now, was it that your technique was off or was it over-aggressive officiating? Crouser: It was a frustrating, frustrating moment. I still believe I didn’t foul. It is what it is. There was just difficulty with the officiating. It was a similar throw to all the other ones I had. At least they kind of clarified that rule now. They’ve made a new clarification on the heel foul out of the back and so I’m just glad that some positive came out of that. At least now we know going forward whether those fouls will probably be a little more concrete with evidence required to call them. T&FN: We understand that you had to be ready to go to the medal ceremony because you thought the appeal might go through. But apparently not everyone was happy about that. Crouser: Yeah. That kind of got taken the wrong way. The appeals do take a long time. We did the in-competition appeal where they just look at the camera but when you don’t have a camera at the back of the ring, the protest came back as inconclusive, as in no evidence to overturn it. So then the burden goes upon USATF to prove whether or not it was a foul. That appeal takes a lot of time and right within an hour before of the podium [the next day], they still had not processed the appeal and it [usually] takes an hour. It took an hour to get from the hotel to the stadium in London with the traffic. So they said go to the stadium because your appeal has not been processed and they won’t postpone the medal ceremony. They said go and wear your podium attire because if it goes through, you won, if it doesn’t, you won’t be on the podium. I just did what I was supposed to do. And a lot of people took that as, “Oh, he’s protesting the officiating” or “he’s trying to prove a point that he should’ve won.” A lot of people took it a lot of different ways. I just did what I was supposed to do; the appeal had not yet been settled and the protests had not been settled and it was still up in the air. That throw was not verified as being a foul. We were just waiting. And then it turned out it didn’t get a chance to be reviewed. I didn’t find out until 5 minutes before the medal ceremony. T&FN: Just being there and watching the ceremony had to put you in a bad spot. Crouser: It was just frustrating. I went and I was sitting in the stands waiting for a call or text saying either it’s been verified and you won or it’s been rejected and you didn’t. I just tried to handle it as best I could. I went to the USA camp and hung out there and then just went and sat in the stands. I didn’t really feel like being around people too much. 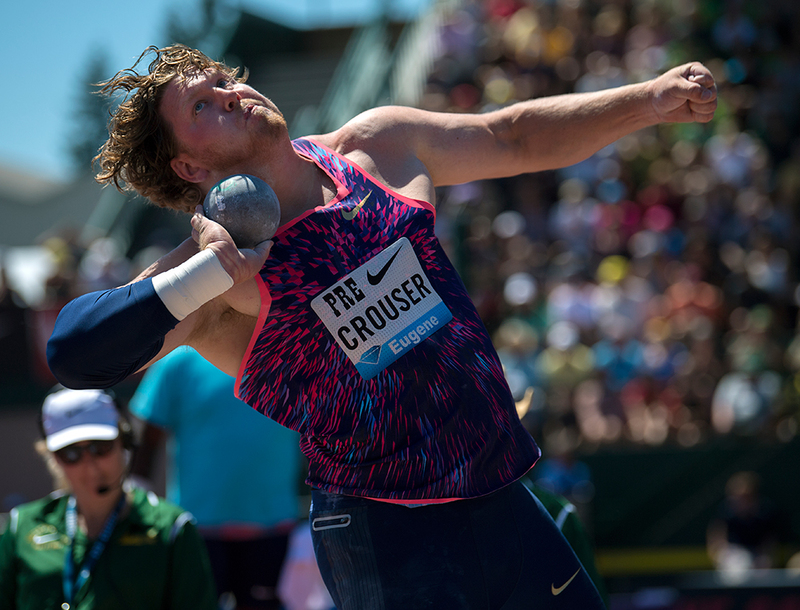 At this stage in Ryan Crouser’s career, we wondered if he could offer any hope to his many fans who want to see him throw the discus seriously. “It might be a ways down the road. I’m sticking with shot through 2020 for sure. I would really like to win World Championships in 2021 in Eugene. That would be a really special homecoming for me. T&FN: We saw a quote recently from Tom Walsh where he said, “I hate losing to anybody but I especially hate losing to him.” He’s referring to you. Is that rivalry mutual? Crouser: I feel the same way—I don’t like losing as well. I’d say in general for me it’s nothing personal. I just don’t like to lose to anybody regardless. I guess Tom might take it a little bit personal, really not liking to lose to me, but I mean we’re all out there competing, doing our best. If somebody throws better than me on that day and it gets the best of me, all the credit to them. T&FN: With your delay getting started this year with your finger injury, is there any extra frustration with Walsh and some other throwers opening up so hot? 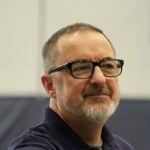 Crouser: Just knowing I had been in definitely the best shape of my life for December and January and felt like I was really ahead of schedule. And I enjoy throwing indoors. I was really looking forward to that. Missing all the indoor season was frustrating, and then, seeing some big marks come out from people all over the world, especially Walsh and [Tomáš] Staněk, it was just tough. Any time you’re injured is tough. And to see guys that you compete against throwing well when you can’t throw at all, it’s frustrating. I just used it to motivate me and have come back pretty well. The hand is finally healthy. I did try to use it to my advantage a little bit. I have been hitting the weight room harder. I felt like I at least made some strength gains during that time even though I wasn’t able to throw. 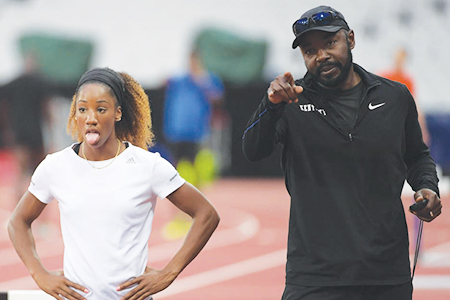 T&FN: Both you and Walsh have referred to wanting to go after that World Record. Is its expiration date almost up? Crouser: It’s definitely getting closer. I mean you can see the throws are creeping up slowly. You see Tom moved from a PR, it was going into this year [72-7¾/22.14] and then you see a big throw at 22.31 [73-2½] indoors and then a 22.67 [74-4½] down in New Zealand. You can see people closing in. He’s made a big jump this year in terms of what his maximum distance is. I’m just kind of hoping for one of those. I’ve been consistent in that 22.20–40 [72-10–73-6] range with my farther throws being in the 22.50s [73-10+]. If I can have a 40–50 centimeter jump like that, that’ll put me right at the World Record. I’m all about consistency because that’s what wins big meets, you being consistent day in and day out. You’re gonna win meets. And so if I can get this year, hoping to be more consistent in that 22.40–22.60 range [72-10–74-1¾] and if I can get to that level, you start looking at those big throws that could be close to the World Record. It’s just kind of slowly chipping away and keep working and doing everything I can to line things up for that to happen. If I have to say, I would say we see that World Record go down before Tokyo, if not this year. T&FN: Do you still consider yourself a young thrower? Where are you in your career arc? Crouser: I’d say in terms of throwing age, I’m definitely not young anymore. I’ve been throwing, what is it, 13 or 14 years now. In training age, I’m up there, but physically, I’m still definitely on the upward trend. I still think I definitely have a long way to improve and so I’m excited to see not only this year but also just looking long term towards 2020. I think that is when I’ll be really in my prime. Taking things relatively conservative and not trying to get it all at once but just prolonging my training and my career so that I can avoid injuries and stay healthy and hopefully hit my true peak in a few years. 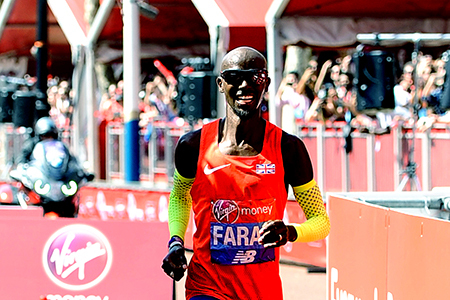 T&FN: Looking at a 2016, knowing in your heart that you can pull off a perfect season and win the Olympic gold, does that take anything away from your hunger or is it more of an advantage knowing that you know how to get there? Crouser: It’s definitely just a motivator. Knowing that in terms of throwing, I’m definitely a perfectionist and extremely competitive. I go into every meeting wanting to throw a PR and wanting to win. I look forward to every chance I have to compete at every opportunity and this hand injury has really just reinforced that. For me, it’s just a motivator to look forward to having a perfect season, going undefeated. T&FN: What’s on your calendar for this year? Crouser: I’m looking forward to opening up at Drake. And then probably have one meet between Drake and Prefontaine, most likely the meet here in Chula Vista. We have an event here that’s got all the throws involved. I think it might have a couple of jumps and sprints as well.